I received a wonderful thank-you letter from someone who discovered this website and was inspired and encouraged to go forward in publishing her own book of family history and stories using Lulu.com. Theresa’s book is beautiful! She used a free Lulu template and her own photos for the cover. She created the book to honor and memorialize her Irish immigrant grandparents. She turned her own memories and the information she discovered from researching into a nice story and then followed that with the individual stories told to her by elder living relatives. She included old photos, copies of some genealogical documents such as immigration and census records, and some copies of old handwritten letters which she typed up content or summaries of to add below them. She even included a few of her grandmother’s recipes. Theresa’s goal was “to document and share with family members and my grandchildren so that they would also benefit from this wonderful history,” but something interesting happened. I will let her tell this story. I had a wonderful and unexpected gift from doing this book, too. I had ordered about 50 copies to give to cousins and relations. My intention was never to market this book as it was a private and personal story. However, I found that only a handful of my first cousins were really interested in the subject or even the process to complete the project. Of course, there are just times in one’s life when we are interested in family history and also there are usually only a few family historians who really value the information. I don’t think it was my writing, but just the subject matter. Interesting, too, is that we all see “our family” history through a different lens. Last spring, newly retired, my husband and I took a transatlantic cruise from Ft. Lauderdale, Florida, that ended in South Hampton, England. At the last minute I made arrangements to meet my cousin Margaret in London . We had met over 40 years ago when she visited my grandmother one summer. We were never in contact again but somehow reconnected and it was like we knew each other. She shared to me that the love of her mother and my grandmother from their modest cottage in Donegal was present at our table. We both shared tears, laughter and much love that day in our memories. Upon returning home, I sent Margaret one of the books. She wrote to me that she got home from work and didn’t take her coat off but sat and read and cried reading the book! She loved the stories! 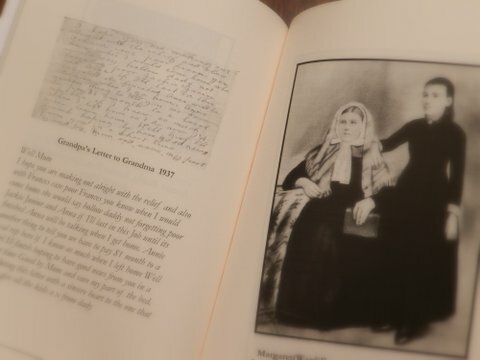 Margaret quickly spoke to her relations and the book was purchased online from Lulu from my relations living all over the United Kingdom, Ireland, and Australia. They all bought the book and we have opened an active dialogue about our mutual family history. These are all descendants of my grandmother’s siblings and even her parents descendants. There are many relations that I truly never knew at all. My grandmother was one of nine children with only her sister emigrating to America. She has also been deceased since 1977 so many family connections were lost. This past October my husband and I traveled again and we went to Scotland and Ireland. These trips were filled with meeting and enjoying family members all over. 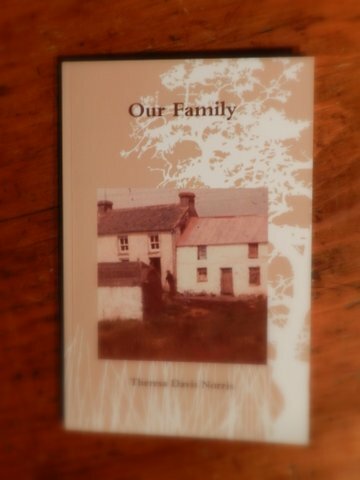 The book, Our Family, was really my entry to my family history and now a living history that is a fantastic treasure to me. I have made friendships with my relations that will last forever. When we visited Ireland and the family homestead we were given the grand tour of places that we would never have had access to or even known about. Relations from England flew to Ireland to ensure that we would see our family history! These were cousins who I never knew or ever met. The book was my introduction to them and led them to invite me into their lives and to uncover and celebrate our family history. I want to thank you again for your inspiration and encouragement as it really made a difference to me to complete my project! Blessings! Congratulations, Theresa! You have received many blessings thanks to your book! Note: Theresa did have some issues with Lulu.com’s printing. The copies printed in the UK were great, but the US batches of copies she ordered sometimes had problems with how the photos looked. Theresa said Lulu did replace the bad copies with good ones at no charge, but this is something to watch for. Last spring I published through Lulu copies of my mother-in-law’s stories and recipes, including old b&w and new color photos and they turned out perfect (color interior! ), so who knows what’s going on. It always pays to get a proof copy in print – do not depend on an electronic copy (e-copy). How wonderful to be able to connect with relatives far and near through a family history book! The documents show that a person existed, but a book provides a way to tell the story behind the statistics. Dear Linda and Theresa, What a vivid example of the power of writing and sharing our life stories to connect, heal, transform family dynamics. Congratulations on your lovely family history book, Theresa. I also appreciate your tips about using Luu.com, Linda. . Often times, the story behind the story is as compelling as the story itself, as it seems to be in this case. Thank you both for sharing. Linda, that is great news. I unexpectedly had one of my students publish too. Most of them never carried on with their project after class had ended. It’s incredibly special and you deserve it. Congratulations and may the blessings continue. Hi Linda, just a heads up that I have moved my blog address to a cheaper, more migraine-friendly address. You are very welcome to join me there. I will do my utmost to get back here and support you as often as I can. Thanks for letting me know, Cate, and congratulations on your student’s accomplishment after your training. I’m waiting for you to start your book, Koji-san! Yes, this has got to be the most inspirational story I’ve heard so far. I often hear that nobody in the immediate family is interested, so I’m really pleased Theresa went ahead and was so well rewarded for her efforts. And it doesn’t matter that no one in the family is interested now, somebody in the future may be so glad to find the stories.